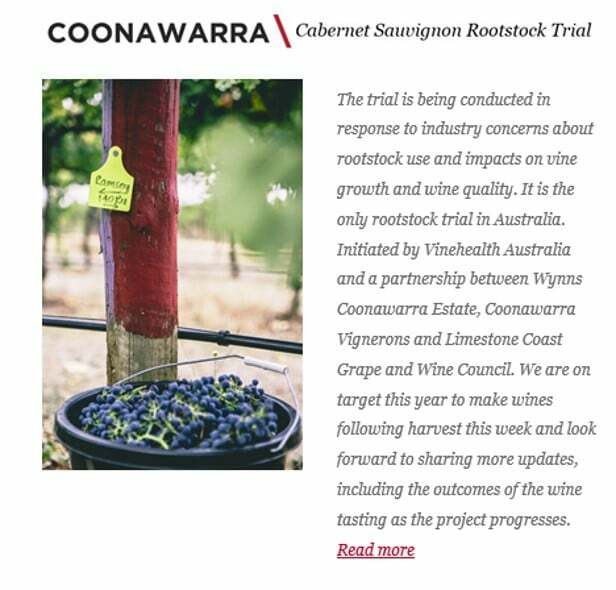 A long-term project is underway in Coonawarra to broaden our understanding of rootstock performance in that region. Rootstock use in South Australia is currently limited to approximately 26% of plantings (only 11% in Coonawarra), thus facilitating high susceptibility to phylloxera. A long term, randomised and replicated rootstock trial was setup in 2009 as a partnership between Vinehealth Australia, Treasury Wine Estates and Coonawarra Vignerons, on the region’s famed terra rossa soil, to compare the performance of own-rooted Cabernet Sauvignon (CW 44 clone) vines against that of eight rootstocks of varying vigour. This trial also evaluates Börner, a German-bred rootstock only currently planted to 0.15Ha in SA, touted as immune to phylloxera, but has been found to support some root-feeding in Australia. All rootstocks are pruned back to a standard bud number each season and as a result we can confidently say that rootstock played a significant role in affecting the vast majority of yield and vigour components in the 2014/15 and 2015/16 season and this was not driven by differences in bud number for the different rootstocks. Little data was collected from seasons 2016/17 and 2017/18 due to unforseen circumstances but this will restart for 2018/19. Colour analysis and salt analysis are to be undertaken for vintage 2019 and small lot wines will also be made. Rootstocks affected yield and growth habit. Apparent bunch weight differences were likely driven by differences in berry number per bunch and berry weight (to be investigated in 2016/17). General consistency in results for yield and canopy measures with Own roots, Börner and M6262 generally lowest for measured attributes and 110 Richter, 1103 Paulsen and 140 Ruggeri generally highest for measured attributes. As expected, rootstocks with high fruitfulness also had higher yield, larger bunches, higher pruning weight and larger trunk circumferences. Some interesting maturity results were noted with M5489 showing the fastest rate of ripening and lowest pH at harvest; whereas Own roots and M6262 showed lowest titratable acidity and Own roots had highest pH at harvest. Own roots appears slower growing than all rootstocks. Merbein clones planted as potted vines one year after other rootstocks, and especially M6262, are slow to establish. Börner rootstock, rated overseas as conveying high vigour to the scion, appears in this trial to be moderated by the calcareous soil or for another reason. Grape phylloxera (Daktulsphaira vitifoliae) is a devastating pest of grapevines worldwide, affecting both commercial and ornamental vines. Adult phylloxera feed on leaves and/or grapevine roots causing death of the European grapevine, Vitis vinifera (that we term ‘own-rooted’ vines). In Australia, the roots of V. vinifera, are extremely susceptible to attack by the phylloxera present, but the leaves are resistant to these strains. Rootstocks used commercially in Australia are considered to vary in their resistance, or tolerance, to different phylloxera strains, and research continues in this area. Phylloxera tolerant rootstocks are those on which phylloxera can feed, reproduce and cause root galling (nodosities), but limited economic damage. Phylloxera resistant grapevines are those on which phylloxera cannot develop to the adult stage so there is no egg production and no gall production. With the lack of available chemical or biological controls for phylloxera, the only proven cultural method to manage phylloxera is to pull out infested own-rooted vines and replant with new vines that have been grafted onto phylloxera-resistant American rootstocks. 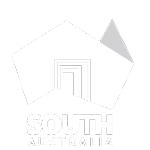 The fact that 74% of South Australian vineyards are on own roots underlines the susceptibility of South Australian vineyards to phylloxera. Vinehealth Australia is a keen supporter of research to better understand rootstock characteristics and their impact on vine attributes and wine quality and style.